Uncategories BC election 2017: do the Green split the vote? BC election 2017: do the Green split the vote? Note: I'll talk about vote splitting in this blog post. I'm simply analyzing what the numbers are showing. Please do not get upset because you don't like the conclusions. Also, and this is important, I'm of the opinion that a party should never be blamed or attacked for splitting the vote. It's not their fault our electoral system is stupid and things like this can happen. I also strongly believe that people should just vote for their favourite party but I understand why many could be concerned with this vote splitting. Hence this article. Day 2 of the campaign. I have updated the projections with the Ipsos poll published yesterday. Another poll with a BC NDP lead but with a very hugh number of undecided (20%), which means that my non-proportional allocation of undecided gives us pretty much the two parties tied. As I said yesterday, I understand some will be upset that I give slightly more undecided to the incumbent (instead of going purely proportionally), but this isn't a bias, this is based on a careful observation of multiple elections in this country. Also, As I mentioned as well, I'll likely change this allocation as the campaign goes on. This could particularly happen if the Green party falls below 10% and the BC NDP emerges as the anti-Christy Clark force. But as of right now, I'll defend my method and remind every one that allocating undecided proportionally is making just as big of an assumption, potentially an even bigger one. Note: a new Forum poll was published and added to my average. The projections below are therefore not fully up to date. Go to the BC Election 2017 page to see the new projections. Anyway, you probably noticed that despite projecting more seats for the party of John Horgan, the chances of winning are lower. It is not a mistake. It actually makes complete sense and I'll explain it to you. Before I do however, notice the probabilities do not sum to 100%. This is because I have decided to treat ties as their own outcome. I understand that tradition and constitutional arrangements in this country dictate that Christy Clark would remain Premier, but it opens the door to a lot of complex situations. The probabilities come from simulations where I randomize the voting intentions as well as the vote efficiency. So in some simulations the Liberals beat their poll numbers (and win more seats). 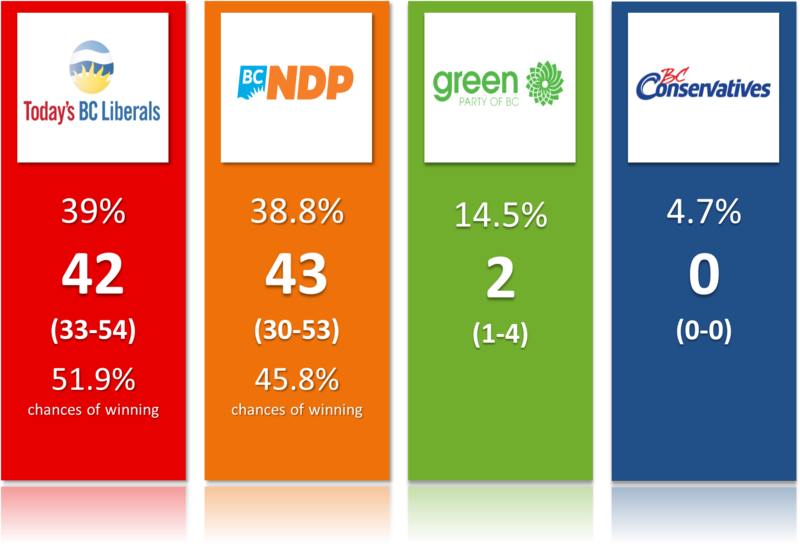 In other simulations, the BC NDP does better than anticipated and win more seats. That's all good and symmetrical (mostly). However, here comes the Green party. When this party gets more votes than expected, it also wins more seats (in average of course, sometimes this vote is "useless"). But here's the kicker: these seats are taken from the NDP. 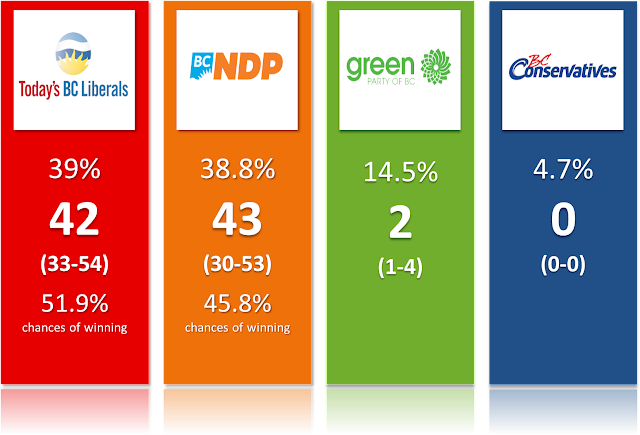 Look at the detailed projections on the BC election 2017 page and you'll see that all the ridings where the Green party has chances (more than 0% but less than 50%) are ridings currently going NDP. Another way to see this is to look at the correlation between seat totals. The number of seats of the NDP and Green are strongly negatively correlated. On the other hand, the seats between the Green and Liberals are positively correlated (How? This happens when the NDP performs worse than expected which gives seats to the Green -on the Island- and the Liberals - elsewhere). So this leads us to our topic of the day: do the Green split the vote with the NDP? This is an incredibly important question because many people in British Columbia, the majority actually, would like to change government. But the "change" vote is split between the NDP and the Green (and the BC Conservative I guess, but this party is already low and will likely go lower), this opens the door to a 5th consecutive mandate of the BC Liberals. Our first evidence is what I mentioned above. The results are pretty clear and I'm very confident about them. But there are other ways to look at it. As you can see, the NDP would easily win a majority if the Green party didn't exist. At least based on the current projections and the available information regarding the second choices. So there as well, the conclusion would be that yes, the Green party is splitting the vote with the NDP. Since I provided two pieces of evidence that a split is occurring, I want to mention evidence of the opposite. First of all, Andrew Weaver (the Green party leader) got elected 4 years ago thanks to an extraordinary personal effect (i.e: he performed much better than a "normal" Green candidate would have in this riding). This effect is estimated to be around 28 points (this is huge by Canadian politics standards). My estimations however show that this bonus was taken almost equally from the Liberals (-15 points) and the NDP (-13). So at least in this district the Green got a MLA by taking votes from both parties. Secondly, the Green didn't run a full slate of candidates in 2013. In fact they only ran 61 candidates (out of 85 ridings). When I looked at what happened in the ridings where there used to be a Green candidate in 2009 and none in 2013, I consistently found that the BC Liberals benefited the most while the BC NDP barely took advantage of this. The effect is so strong that it partially explains how the Liberals managed to increase their shares of votes in a couple of ridings despite dropping provincially. So if the Green party runs a full slate of candidates this time around, it's not illogical to think they'll hurt the Liberals more. At the end of the day, if I have to go with a yes or no answer to the question asked in the title, I'd have to go with yes, the Green party is splitting the vote. Or, more exactly, the BC NDP and BC Green are splitting a very similar vote. Since the BC NDP is currently ahead, I guess it makes sense to say the Green are the ones splitting the vote. As I mentioned at the beginning, I believe people should stop trying to do math before voting and just pick the candidate/party they like. But the electoral system being what it is, I understand the concerns of some of you. If you really just want to get rid of Christy Clark, voting NDP is most likely the rational choice. At least based on the current situation and information. Who vote for the BC Green Party? What if BC had the French electoral system? Présidentielle 2017: à 4 jours du vote! The BC election begins today!